Making a balloon car is a fun craft project and educational science experiment that can be done with kids. This activity can be used to help teach kids how wind energy can be used to propel an object, as well as other principles in physics like momentum, force, friction, and speed. It's also a great lesson in recycling and how to re-purpose waste items into fun toys. You'll only need a few simple materials: some sort of base, straws, skewers, tape, and a balloon. 62 by 15.24 centimeter) rectangle out of cardboard. Use a pen and ruler to draw the rectangle first. Cut the rectangle out with a pair of scissors or a craft blade. You can also use foam core. It is the same thing you use for presentation boards. For a fancy car, paint the cardboard with acrylic paint or cover it with duct tape. Let the paint dry before moving on. 62 centimeter) pieces from a straw. Do not include the bendy part of the straw. Use only the smooth, straight part. These will hold the wheels and axles in place. Lay the straws across the cardboard widthwise, ½-inch (1.27-centimeter) from each narrow end. Make sure that the straws are straight and parallel to the ends of the cardboard. If they are crooked, your car won't go straight. Secure the straws to the cardboard with tape. Use sturdy tape, such as duct tape. This way, the straws won't wiggle loose. Make sure that the tape covers the entire length of each straw. 16-centimeter) pieces from a wooden skewer. Cut the pointy ends off of the wooden skewer first. Next, cut the wooden skewer down to 4 inches (10.16 centimeters). You will need two such pieces. These will make the axles for your car's wheels. If scissors aren't tough enough for the job, try wire cutters. If you can't find any wooden skewers, use lollipop sticks instead. Make sure that they roll around easily in the straws. You should have about ½ inch (1.27 centimeters) sticking out of each end. The wheels will go onto the skewers next. This will allow the axles to rotate freely inside the straws and allow your car to move. 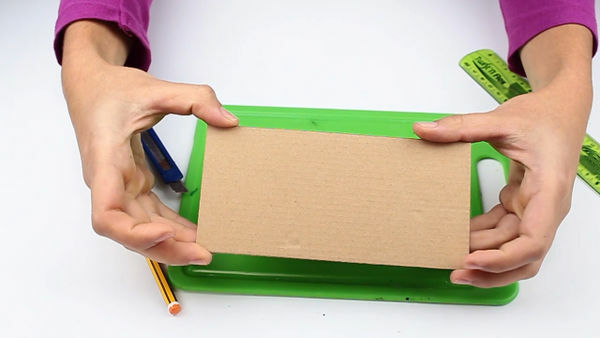 Use bottle caps or large coins to trace four circles onto a sheet of cardboard. Cut the circles out using a pair of scissors or a craft blade. Make the circles as even as you can. You can also use bottle caps instead of cardboard. Poke a hole in the center of each wheel. Slide the wheels onto the ends of the skewers. Make sure that they don't touch the cardboard, or they may get stuck. If the wheels are loose, place a drop of glue or clay on the end of the skewers. Don't worry, this won't stop the wheels from turning. If you used cardboard or foam core, you should be able to make the holes using a pen, pencil, or a skewer. If you used bottle caps, you will need to punch the hole using a nail and hammer. Ask an adult to help you. Slide a straw into a balloon by 2 inches (5.08 centimeters). Wrap some tape in a tight spiral around the end of the balloon. Extend the tape over the edge so that it covers part of the straw. Make sure that there are no gaps. You want an airtight seal. Use regular balloon, not a water balloon, noodle, heart, alien, worm, etc. Turn the car so that it is standing on its wheels. Place the straw and balloon on top, each facing a narrow end. Make sure that the straw is straight. The balloon should be resting on top of the cardboard and the straw hanging over one of the ends. Tape the straw securely to the cardboard. It's okay if the straw is hanging over the edge of the car. If it is touching the ground, trim it down. Don't let the balloon hang over the edge. If you do, it will bump against the ground and stop your car from moving. Blow some air into the balloon through the straw. Pinch the straw shut so that the air doesn't escape. Place the car on a smooth, flat surface. Let go of the straw and watch the car go! The straw is the back of the car. The balloon is the front. If the balloon is not holding air, there may be a gap. Wrap some more tape around the end of the balloon. If the balloon still is not holding any air, it might have a hole in it. Get a new balloon. You can also use a small pint-sized milk carton as well. If you want a fancier car, you can paint the juice box with acrylic paint, or cover it with duct tape, fabric, etc. Make sure that the carton is clean and dry. Your juice box will have a front, back, and two side panels. Cut the straws so that they are the same width as the front of back panels. Make sure that you are cutting the smooth part of the straw. Do not include the bendy part. Set the box down so that the front is facing you. Lay the straws down on top, about ½ inch (1.27 centimeters) away from the top and bottom edges. Secure the straws to the box with a strip of tape. These will hold the axles and wheels in place. Make sure that the straws are straight. If they are crooked, your car won't go straight. Use strong tape, such as duct tape. Cut the pointy ends off of the skewers first. Next, cut the skewers down so that they are about 1 inch (2.54 centimeters) wider than your box and straws. If you don't have any skewers, you can use lollipop sticks instead. Make sure that they can slide into the straws easily. You should have about ½ inch (1.27 centimeters) sticking out of each end. You will be mounting the wheels onto the ends of these next. 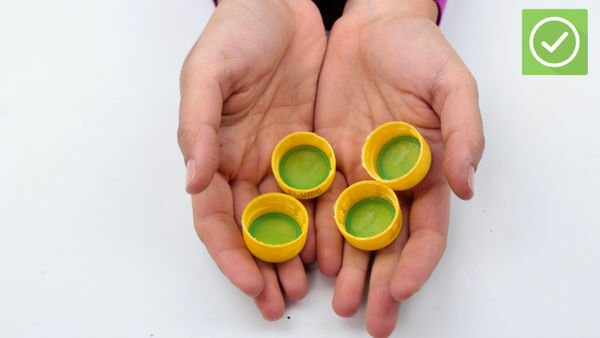 Fill four bottle caps with clay or pieces of sponge. Press them onto the skewers. Do not let the clay part touch the straws. You can also secure them with hot glue instead. If you don't have any bottle caps, you can use buttons instead. You can also cut circles out of cardboard. Make sure that they are all the same size. Slide a straw about 2 inches (5 centimeters) into a balloon. Wrap a piece of tape over the mouth of the balloon. Extend the tape over the end of the balloon and onto the straw. Make sure that there are no gaps. Center the balloon and straw on top of the juice box. Part of the balloon will be hanging over the end of the juice box. Part of the straw will be sticking out over the other end. Make sure that the straw is straight, then place a piece of tape over the straw to hold it in place. Use sturdy tape, such as duct tape. If the straw is too long, cut it down. 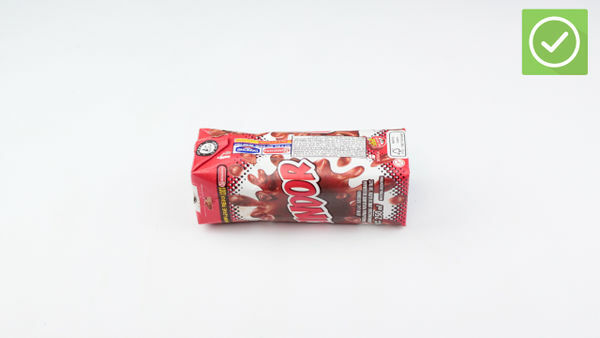 You want only about 1 to 2 inches (2.54 to 5.08 centimeters) sticking out over the edge of the box. Blow into the straw to inflate the balloon. Pinch the straw shut. Place the balloon on a flat, smooth surface. Let the straw go, and watch the car zoom! Blow up the balloon. Don't tie the end; rather, just hold it closed with your hand. When you're ready, let go of the balloon end and watch your car go! You can use a water bottle or a soda bottle. Remove the cap and peel off the label. Clean the bottle out and let it dry. The best size is a small water bottle. Make sure it's thoroughly rinsed it out and clean, especially if you’re using a soda or juice bottle. Measure across the bottom of your bottle. Cut two pieces of straw down to that measurement. Use only the smooth part of the straw, not the bendy. These will hold the axels and wheels. Tape the first straw about 1 inch (2.54 centimeters) from the bottle. Tape the other straw about 1 inch (2.54 centimeters) below the domed part. Make sure that the straws are straight and parallel to each other. If they are crooked, your car won't go straight. If your bottle has ribs, use those as a guide. Use strong, sturdy tape, such as duct tape. Cut the pointy ends off of the skewers first. Next, cut them down so that they are 1 inch (2.54 centimeters) wider than your bottle. They need to be long enough so that they can slide into the straws and hold the wheels. You should have about ½ inch (1.27 centimeters) sticking out of each end of each straw. You will be sliding the wheels onto the skewers next. Get four bottle caps. Draw an X on top of each one to find the center. Use a nail and hammer to punch a hole into the middle of each X. You can also trace four circles onto a sheet of cardboard, then cut them out. You can also use buttons instead of bottle caps. Don't poke holes in them and make sure that they are the same size. If you're scared to use a nail and hammer, stuff a small piece of sponge into each bottle cap. Slide the wheels over the ends of the skewers. Make sure that the inside of the bottle cap is facing out. Don't press the wheels too close to the bottle, or they will get stuck. If the wheels are too loose, secure them with a drop of glue or clay. If you are using buttons, simply hot glue them to the end of each skewer. If you stuffed the inside of the bottle caps with a sponge, simply slide them onto the skewers. Set the "car" down so that it is sitting on top of its wheels. Find a spot on top of the car just below the bottle's dome. Use a craft blade to poke two slits in an X-shape. This will allow you to attach your car's "engine." Tuck a straw about 12 inches (30 centimeters) into a balloon. Wrap a piece of tape around the end of the balloon in a tight spiral. Make sure that the tape goes over the mouth of the balloon and onto the straw. Also, make sure that there are no gaps. You want an airtight seal. Insert the straw bendy-side-first into the balloon. Slide the other end of the straw into the X you just made. Keep pushing the straw through the hole until it comes out of the bottle's mouth. You want about 1 inch (2.54 centimeters) of straw sticking out of the bottle's mouth. If it is too long, cut it down. The straw should bend naturally at its bendy part inside the bottle. Blow some air into the balloon through the straw. Pinch the straw so that the air doesn't come out. Place the car down on a flat, smooth surface. Let go of the straw. Watch the car go, go, go! Fill the balloon by blowing through the straw opening at the end of the bottle. Put your finger over the end of the straw once you're done filling the balloon. When you’re ready, let go of the straw and watch the car go.